The significance these metrics have on bottom line revenue can’t be understated. These are customers that were already paying for a service – that had already gone through a decision-making process, chosen one insurer, and were so dismayed with some aspect of their service that they chose to begin this entire search process again. But there’s a simple solution to this problem; a solution that allows insurers to increase retention rates alongside a slew of other metrics. Insurers: make it easier for your customers to complain. It may seem counterintuitive at first, but you should absolutely want consumers to complain more easily and more often. The important distinction is that those complaints are voiced directly to you. You need consumers to complain to you because once they start complaining to anyone else, they’ll have begun the process of taking their business elsewhere. Each of these benefits can be realized by empowering customers with the ability to complain more easily, due largely to the emotional nature of insurance. This same study determined that, at most, only half of customers who feel like complaining about claims actually do so because they did not think it would make any difference. These customers also stated that complaining looked to be too much effort. This is precisely why we need to make it easier for customers to complain: they currently perceive the complaining process to be more difficult than it is worth – we should proactively make them aware that this is not the case. The benefits of doing so include (but most certainly are not limited to) measurably positive increases in customer retention, satisfaction, and overall lifetime value. Let’s take a high-level look at the tangible impact of complaint-enablement from point of view of an insurance company. Consider J.D. Power’s 2018 U.S. Insurance Shopping Study Customer Satisfaction Index Rankings. The industry average score for providing a satisfying purchase experience is 839 out of 1,000.3 Let’s say, for the sake of this example, that an average-performing insurance company held 1,000,000 policies last year. Of these 1,000,000, we can assume 839,000 were satisfied with the experience. This leaves us with 161,000 customers who were less than satisfied. 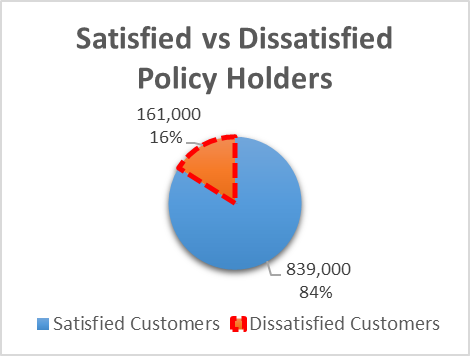 At best, 50% of these customers (80,500 accounts) will follow-up their less-than-satisfactory experience with a complaint, giving their insurance company the opportunity to remedy the situation and regain their trust (and business). But the other 50% of customers who were less-than-satisfied – who may have wanted to complain – simply do not. 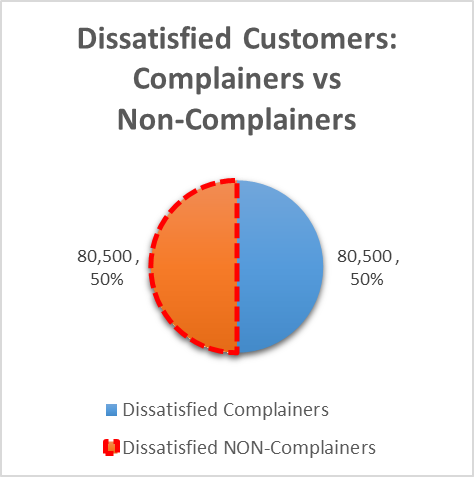 According to Forbes1, 91% of these non-complainers will take their business elsewhere. In this scenario, that comes out to 73,255 customers who may have chosen to stay if they had been empowered with the opportunity to voice their complaints. We know that enabling customers to complain has value. Actually enabling this complaining is a complicated process, but it’s a process that we’re excited to have accomplished and have designed solutions for. For our readers in the insurance field – drop us a line below if you’d like to hear about how we plan on making it easier for your customers to complain. If you would like to get help with complain enablement today, contact us directly or you can also see us in person at one of many Events!